We’ve been getting a lot of questions on what rubber masks are and how to use them. See below for a deep dive into one of the most buzzed about trends in beauty! Rubber masks are a celebrity facial staple that has been around for years in Korea. It’s often used at the last step of a spa facial, especially after peels to soothe, calm and smooth the skin. 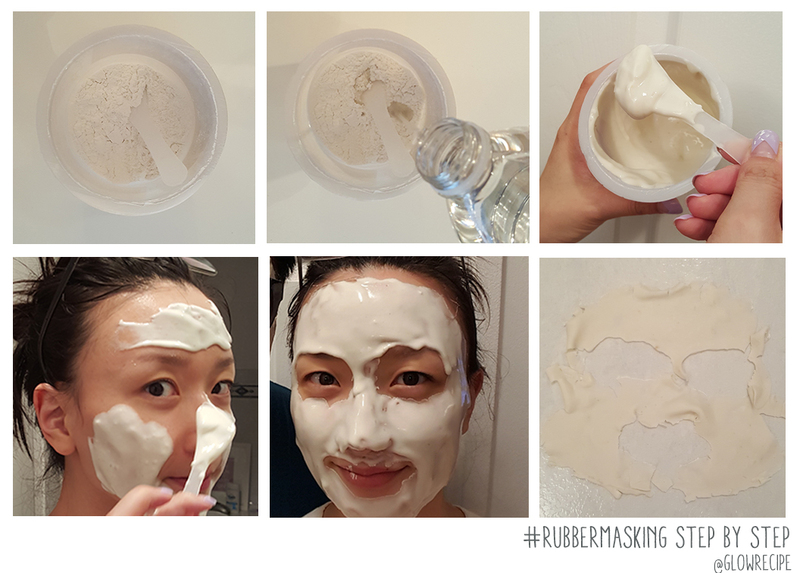 Personally, rubber masking was my favorite step of the facial ritual, as the thick goop slathered over the skin felt like a cooling, calming cocoon. It congeals into a ‘rubber’ like texture after 10~15 minutes. 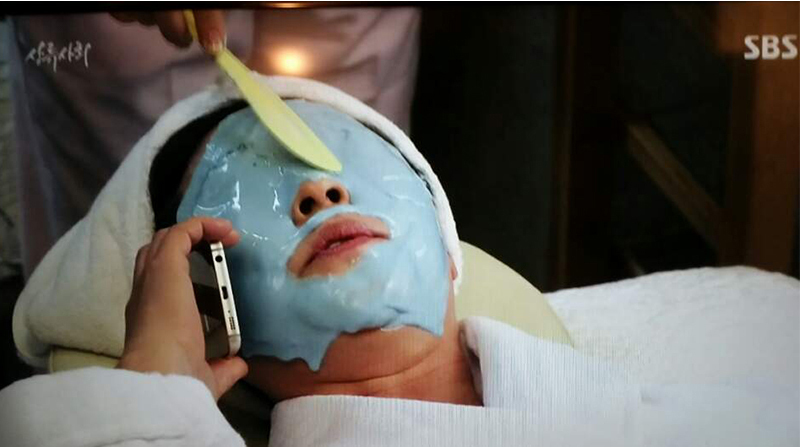 Unlike most peel-off masks, it can be lifted away from skin very easily, and is often slathered on all over the face, including over the eyes, eyebrows and lips – see below photo from the popular K-drama High Society. As the process of dosing out powder, mixing water & cleaning up afterwards wasn’t always easy, rubber masks never really took off as an at-home treatment. Once Lindsay launched their one-time use, pre-dosed cups, the market completely changed – and it’s now firmly established as one of the topsellers at Korea beauty mega-store Olive Young. Rubber masks are usually made of a blend of alginate, diatomaceous earth, calcium sulfates and various vitamin/ mineral powders. The first three ingredients react to water, which causes the ‘rubberizing’ of the mixture. The ‘rubber’ creates a evaporation free barrier, which allows for boosted absorption of skin-beneficial ingredients. Ingredients such as diatomaceous earth also help to clarify skin, minimize the appearance of pores and refine texture, which make rubber masks great for all skin types, including oily & combination. Step 3. Thoroughly mix until there is no powder left in cup and mixture is smooth. It should be denser than cake batter – if the formula drips easily off your spatula, it’s too runny! Step 4. Use spatula to ‘frost’ the face. Apply a very thick layer evenly to face. A quick tip is to apply more formula at the edges – this will make the mask easier to peel off. If done correctly, you should be using almost all, if not all of the formula in the cup. Step 6. Peel away mask and wash off any left over mask on the face with lukewarm water. Follow with usual serum & moisturizer. We recommend rubber masks to be used 1~2 x/ week. If desired, the formula is gentle enough to be used 3~4 times a week. Tip: For an extra boost, apply a serum or ampoule to the skin before applying rubber mask – as the rubber creates a seamless ‘seal’ that contours to the face, this step helps to leave skin extra soft & dewy! Check out our YouTube tutorial here! Rubber masks are known for it’s skin-calming effect – the formula feels cool on skin as you apply, helping to instantly soothe skin. It’s also very effective at softening skin and refining texture. Skin feels purified and baby-soft afterwards, and it’s a great treatment to balance and clarify all skin types. Customers also report that pores appear minimized with continued use. As it’s so easy to remove, it’s also great for sensitive skin types. Allure’s Renee Jacques states, “After I removed the mask, there wasn’t one blackhead in sight, a rare feat for my complexion. My skin also felt crazy smooth—dare I say, smoother than it’s ever felt before?” in her recent review. Refinery29 picks Lindsay’s Modeling Rubber Masks as one of the best detox masks and Vogue France selected it as a ‘new generation mask‘ in its Global Beauty segment. Check out Lindsay’s Rubber Masks in different flavors here, including our newest Hanra Citrus & Charcoal flavors. Have any questions, comments or feedback? We love to hear from you – email us at love @ glowrecipe [dot] com, anytime. Pingback: Rubber Mask | life looks better in black. Thanks for the review and tutorial. These sound absolutely intriguing! I can’t wait until I get mine to try them. I’ve used all manner of wash-off and sheet masks in the past, but this will be my first encounter with one of these new (at least to me) rubber masks. I’m loving the idea of “crazy smooth” skin with pores at a minimum. You suggest possibly using a serum or ampoule before applying the mask. Any suggestions, especially for combo-oily skin and/or anti-aging? How about the LJH Vita Propolis ampoule? I am assuming normal cleansing and toning beforehand, and then the rest of my skincare routine afterwards. Hi JimmyinPA, sorry for the late response! Applying the LJH Vita Propolis Ampoule beforehand would be a great option to ‘seal in’ with the rubber mask. Normal cleansing and toning beforehand and serum and moisturizer afterwards is correct!